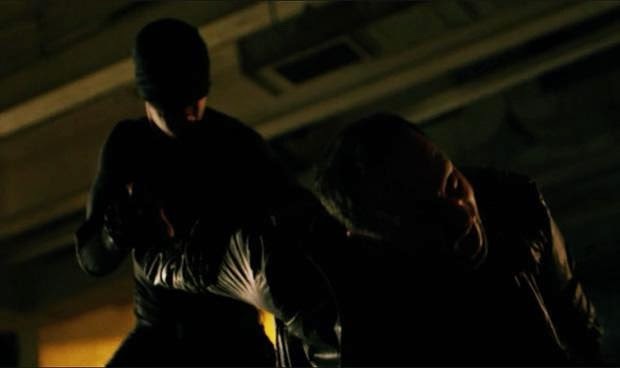 This week I managed to squeeze in another episode of Marvel's Daredevil on Netflix. We're up to episode 4 now and things are starting to get interesting. First off, it can't be understated how violent this show is. Not only is there relentless beating of various thugs and baddies, but decapitations, suicides and even some good ol' fashioned corpse defiling. This show isn't for the faint of heart. It's dark, gritty and unrelenting. During this episode's viewing, I turned to my buddy who was watching it with me and said "Marvel finally gets a TV show right, and all they had to do was pretend they were DC". That's not to start a flame war or anything. It just details how completely different the look and feel of Daredevil is compared to everything else from Disney/Marvel. Anyway, on to the episode. Some key elements started falling into place that will clearly build to a bigger payoff later on. Primarily, Wilson Fisk (Vince D'onofrio) was heavily featured. I have to admit, I'm not keen on his portrayal of the character thus far. The feel I get from him as he awkwardly stumbles around a social engagement before literally smashing a thug's head off with a car door is one of someone not all there mentally. I don't mean unhinged, though he's clearly that. I mean slow. This isn't the criminal underworld mastermind I was expecting to see. It's still early for He-Who's-Name-We-Do-Not-Say, so I'll give the show runners the benefit of the doubt. I'm hoping they turn it around. Overall, the criminal element in Hell's Kitchen is starting to take notice of our intrepid hero. They've even slapped a nickname on him, calling him "the devil" which I can only assume will lead to his eventual moniker of Daredevil. This has it's drawbacks for Matt (Charlie Cox) though as it's putting those that are helping him in the line of fire as well. Namely, our friendly neighbourhood nurse Claire (Rosario Dawson). She's kidnapped and beaten for information she doesn't have and has to be rescued a la damsel in distress by Matt, who tells her his real first name after this shared traumatic experience. The chemistry between these two is undeniable. I'm genuinely curious where it's going to go. Even the Karen Page/Ben Urich story line following Karen's former employer and all the corruption surrounding it is keeping my interest. I had a nasty feeling it was going to start to feel like filler, but it's actually quite engaging. My guess is it will likely lead to Fisk, bringing all our introduced characters into the same arc by season's end. Time will tell, I suppose. I'm still determined to watch this show weekly and not binge it like so many others.